Recon 1 knives have a reputation for their solid construction and functional build. The latest Recon 1 from Cold Steel features a premium CPM-S35VN steel spear point blade with a plain edge and a black DLC coating. 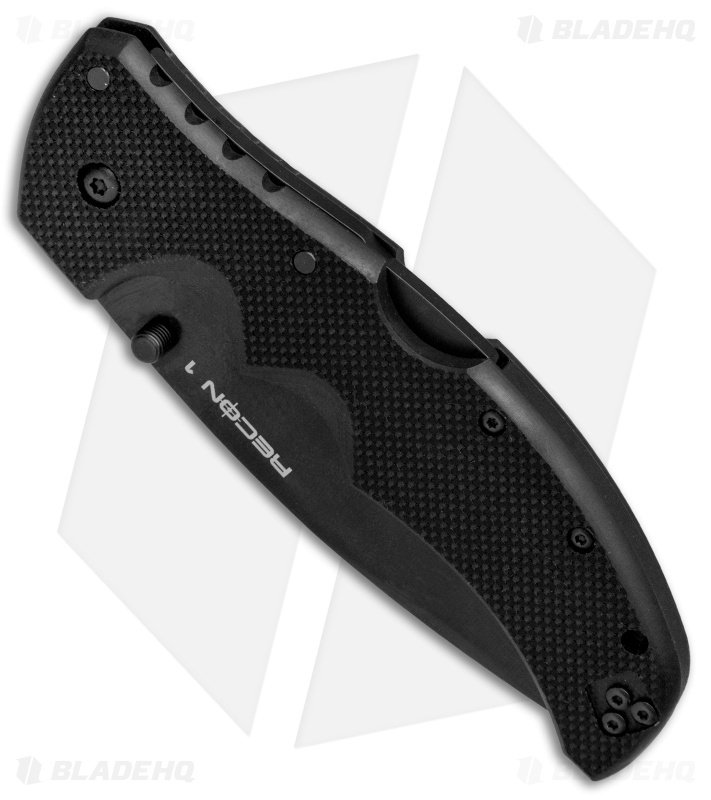 Its textured black G-10 handle has the Tri-Ad Lock, a 6061 aluminum heat-treated back spacer, and a reversible, tip-up pocket clip. 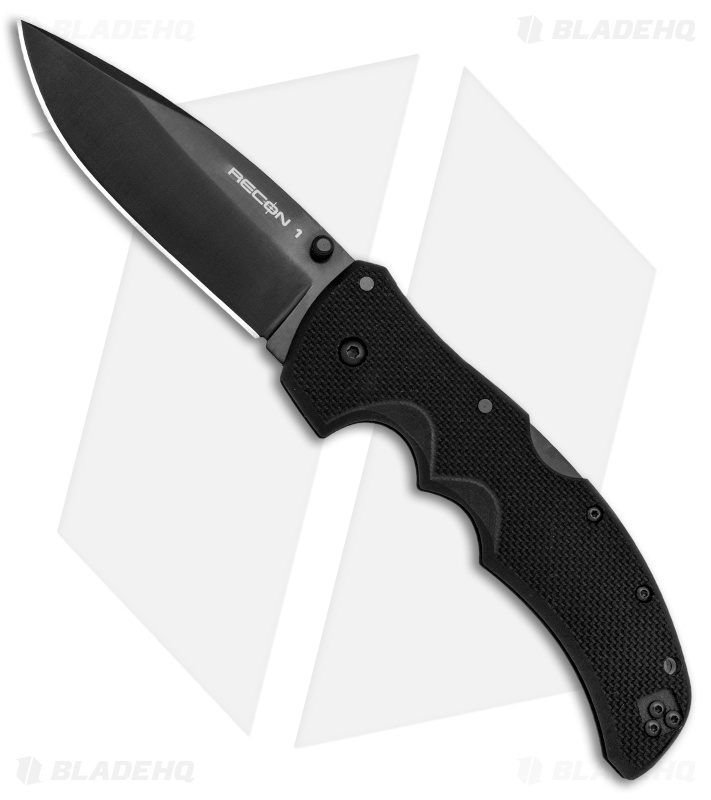 With everything that has made the Recon series a perennial favorite and a premium S35VN stainless steel blade, there's never been a better time to get one! This is a solid and beefy knife. The triad lock is awesome, and not nearly as stiff and hard to operate as a lot of people say. The G10 is very rough but that’s actually a feature that I like about the knife. Very grippy with wet hands. S35vn steel...a great purchase! Solid knife minor issues for me. Pros(for me): Good blade shape and size, handle fits me like a glove, normal reversible clip and thumb stud stuff, pseudo choil to choke up on, beefy triad lock. Good price for materials. Cons: G10 texture is sand paper like I can literally file my nails or buff off skin with these handles. clip doesn't cooperate getting in and out of the pocket between the low ramp and the serious texture. Black on black on black murder-y coloration just isn't my thing. Fixes. Just spent like 1 minute outside with a sanding block and buffed down the G10 to a light/moderate texture definitely still bumpy but no longer sand paper-y(I know for some people this is treason). While I did that I took off the clip to get that area sanded and also took some pliers propped it against the edge of my desk and curled the ramp up a tiny bit on the knife so that it still clips into my pocket but it goes in easy and doesn't fight me too much pulling it out. I was in the market for a large heavy-duty pocket knife. As a middle-aged knife enthusiast I am a bit nostalgic when it comes to pocket knives and I prefer a traditional lockback locking mechanism over the newer flipper types available. After both reading and watching countless online reviews of larger size pocket knives I settled on this Cold Steel Recon-1 because so many people like it. 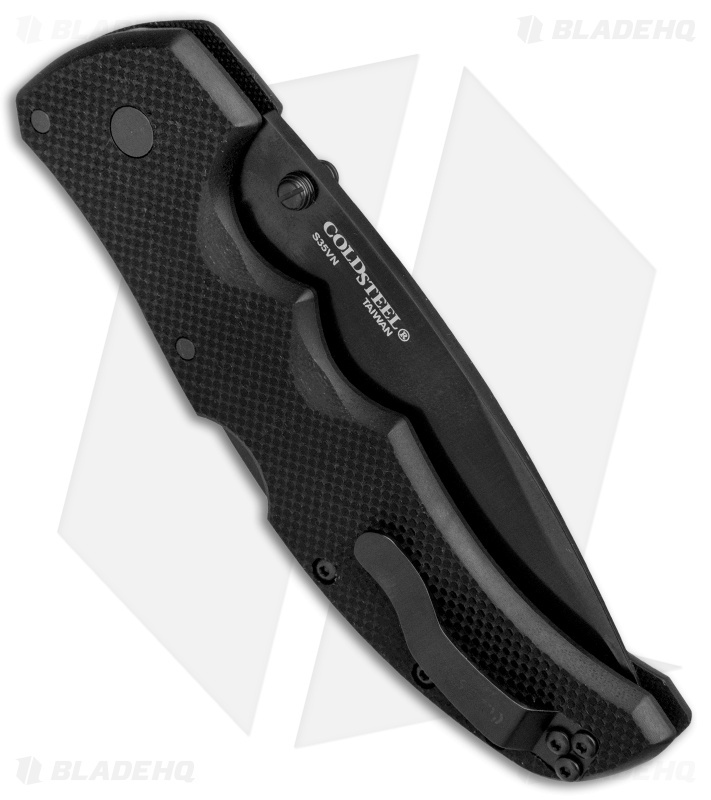 It is a stout bull of a folding knife and is very rigid and sturdy. 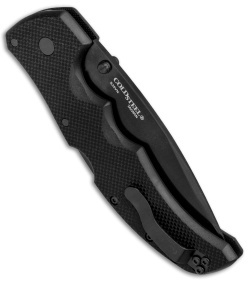 The handle scales are ultra grippy and ergonomically it feels great in my large sized hand. The blade came pretty sharp right out of the box and is perfectly centered and evenly ground. The Tri-ad lock is very secure and there is zero blade play up and down or side to side. This is truly a working man's knife and seems as though it will be able to take on anything that I will throw at it. I am super excited and highly impressed with this purchase. For just over $100.00 with the shipping method that I chose I feel like it was a great deal. Thank you Blade HQ for your part in selling and shipping me this stellar knife. I could not be any happier with it.